Delicious food, a diverse menu, a groovy vibe, fantastic customer service — and no customer base. Running a successful restaurant today is so much more than just offering good food and good service. Yes, while the food and service should always be top priority, it only works out when you have a decent number of customers coming back for more, spreading the word about your restaurant, and reaching out to friends to try the gastronomical experience you have in store for them. Take a moment and think of other restaurants that you enjoy visiting. Why do you prefer some restaurants over others? How do you decide on visiting a new restaurant? When you travel to a new city, how do you choose the restaurants you want to visit? Most importantly, after a long, tiring week, which is that one restaurant you want to go to because you know you’ll come back happy and full? For me, that depends on reviews, or first-hand experiences shared by friends and family. In a new city, local recommendations, or local search platforms, become the go-to solution. If I like a restaurant, the food or the experience, I subscribe to their emails and follow them on social media. That way I hear about new menu items, events they’re hosting, and all the exciting things they’re doing to make my experience even better. For a foodie like me, getting updates on social media, emails and my phone is always a delight. That’s all it takes. I just summed up all the marketing ideas and trends that work for a restaurant, designed to delight customers again and again. Restaurant marketing is completely different than marketing a hotel or the food industry at large. Marketing trends keep changing, and evolving. What’s important is that you keep changing your marketing strategy, and understand how the marketing trends affect your specific restaurant. 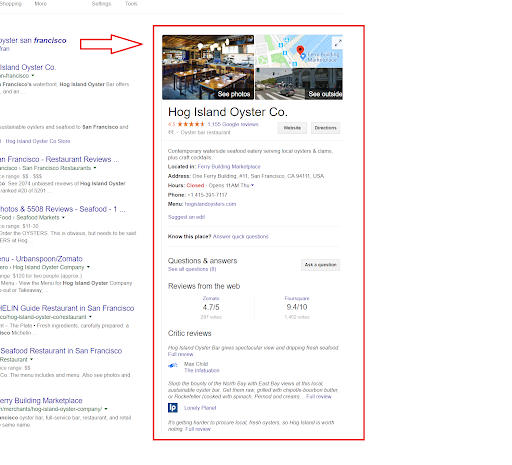 What are the restaurant marketing trends that really work? There are many marketing trends that can further your marketing goals, but focus your efforts on this list of five restaurant marketing trends and ideas. Want to try email marketing for your business? Sign up for your free 60-day Constant Contact trial. Social media platforms are a boon for every industry, but especially so for restaurants. Social media platforms have become the go-to place for customers of all age groups to seek recommendations, reviews, and suggestions. Reaching out to people on social media, and engaging with them, gives you a chance to keep your restaurant top of mind. However, you need to focus on creating user generated content as much as creating your own original content. Utilizing live video through Facebook and Instagram is one of the most highly recommended social media trends, and must be explored. You could take your followers for a trip around the restaurant, in the kitchen, or introduce them to the staff. Focus on taking real pictures that portray the restaurant staff and customers in action, create contests, and urge people to share your restaurant page with their network. Visuals and design play a very important role in capturing your audience’s attention. You need to put in a lot of thought and creativity to get pictures that speak for themselves. This is a nice picture that supports the idea, but is it really an image that would instantly catch your attention? Same concept, same idea, but so much more compelling. 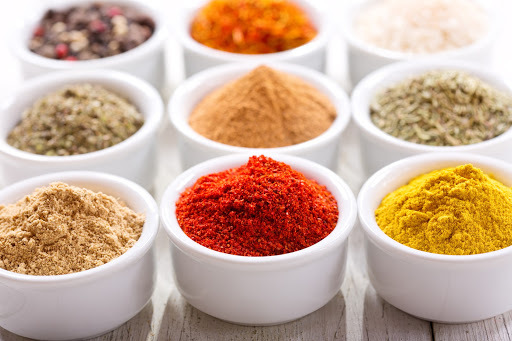 A picture like this is sure to get instant attention, and make people interested in knowing more about the Spice Festival your restaurant is hosting. That’s the power of imagery, and well thought out concept-based pictures. If you’re not already using email marketing as a way to communicate with your subscribers, start doing it right away. Email marketing is highly effective for the restaurant industry to promote itself, and engage its customers. Create an email marketing plan that sends valuable content and information to your readers in order to increase customer loyalty and drive brand awareness. You could include updates for new additions to the menu, information about upcoming events, give out discount codes, scratch cards with exciting incentives, or just simple stories from your restaurant staff. A lot of people refer to their emails when making restaurant decisions. Email marketing for restaurants is also an effective way to ask for feedback, reviews, and referrals. 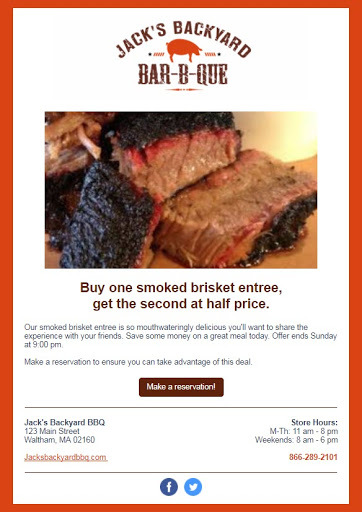 Look at this email that promotes the restaurant’s special smoked brisket, and allows people to make a quick one-click reservation. This would be a perfect email to send just before the weekend starts. Let’s assume your restaurant is hosting a special Ladies Night event to celebrate the occasion of International Women’s Day. Start sending out event emails four weeks before the event, urging readers to book a table now to enjoy 20% off their bill, as well as a free welcome drink. What will each email say? How will you target non-openers? What’s the next email for readers who click on the call-to-action and take the desired action? Once you know the answers to these questions, you can create an automatic email series to make sure all the women get the right message, at the right time. Reports from the restaurant technology industry state that the most important technical features that help guests make a decision are online reservations, free wifi, and online ordering. Partnering with a popular food app gives customers a chance to check out your restaurant, and join available loyalty program benefits that give them deals and discounts. Additionally, making online ordering available for your restaurant increases the odds of enjoying a good meal, without the frustration of waiting for a table. With more and more users turning to online ordering on a regular basis, this creates an opportunity to increase your customer base and get genuine feedback and reviews in return. Almost everybody today goes online to look for food and restaurant recommendations or reviews. Yelp is probably the most trusted online review resource, especially for restaurants. Good reviews on Yelp attracts that much-needed attention from the local customers around you searching for a bite to eat. In fact, whether or not you create an account on Yelp for your restaurant, people will review you. The best thing to do is create your own account so you can portray the restaurant as you like, by adding the right images, keeping track of reviews, and responding to reviewers. The current generation of online users are consuming content from credible food bloggers and industry influencers. Partnering with those influencers gives a boost to your restaurant marketing. Invite bloggers and influencers to your restaurant, offer them your best, and ask them to share a genuine review or feedback on their preferred network. Making live social videos with them, and requesting they do the same, can drive more potential customers to both your social pages and your restaurant. People today turn to influencers for suggestions and recommendations. It’s important that you work out a way for the bloggers and influencers to not just share a review of your food, but also offer a comprehensive review that speaks to the overall experience. Restaurant marketing is all about creating an unforgettable experience for your customers. The way you market your restaurant can excite people to come visit and dine with you. It’s nice when people rave about your restaurant, online or offline, but it’s even better when you can harness the conversation to get more people to notice you. This is called word-of-mouth marketing. As a restaurant, reviews are the foundation of your success. Create marketing campaigns that urge people to share more reviews, and then use these to pull more people in. With big and small restaurants at every corner, you need to convince your customers why you’re the better choice. Do it with delectable food, an excellent dining experience, and innovative marketing strategies. 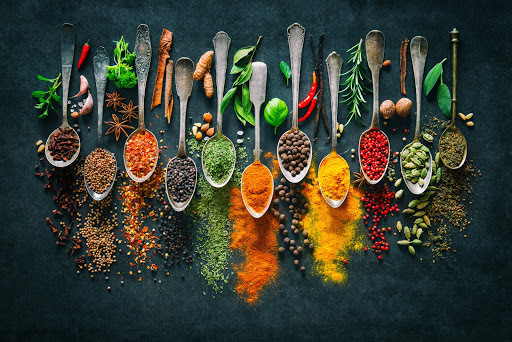 Collect all the ingredients you need to make a strong marketing plan, and cook up an experience that leaves your customers with a delightful after taste.